CiT Matrix comes with 75 RGB LED's on the front panel and it is programmed to show various LED colours by using the RGB switch on the top. The Matrix supports ATX motherboards and there is also bright 32 LED's and a 12cm fan at the back to give the case much more colour. 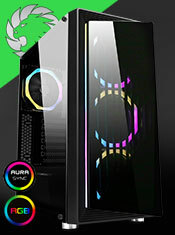 The chassis comes with a top PSU cover design which allows a clean inside space once assembled, the entire top area can be used to reorganise cables, which makes for a tidy-looking system and richer internal space to allow the user to easy install components, the enlarged window side panel allows the user to show off there internal components, 1 x USB 3.0 port with up to 3GBT/S super speed transferring rate. 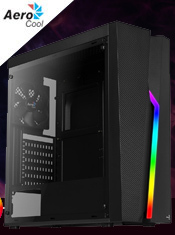 Chassis Type - Mid-Tower ATX Case in black. Interior - Black coloured interior. I/O Ports - 1 x USB 3.0, 2 x USB 2.0 and HD Audio. LED's - The front panel comes with rainbow LED's (75pcs) programmed in. The colours can change by 15 programmed lighting methods. RGB Switch - RGB switch located on the top make it easier to switch the colours of the LED's. Blue LED Fan - Rear panel includes a 1 x 12cm 32 Blue LED fan.